Pro Display’s continued relationship with institutions of artistic excellence has an illustrious history of cooperation in delivering the highest quality displays available. Of course, for professional artists, display quality is of the utmost importance when demonstrating their work, so it stands to reason that using the finest display technology on the market is the choicest way to do so. Over the years, Pro Display have supplied art colleges, galleries, exhibitions and even individual artists with innovative display solutions in the pursuit of using technology to achieve a quality of display that is nothing short of professional. Experts turn to Pro Display for such solutions for a number of reasons, least of not which is the stellar reputation we carry within the AV industry, having supplied and worked with some of the world’s biggest brands on some of the biggest AV projects ever seen. Exporting worldwide and offering innovative technological solutions not often seen are reasons only enhanced by Pro Display’s dedicated and skilled team, who work tirelessly with customers on projects, ensuring they have the best possible solution for their requirement. One such project we were recently very happy to assist with was for NOW Gallery in London, who required 3 pieces of 4.6mx 2.15m High Gain Rear Projection Film to be installed in a portrait format onto their exterior facing glass façade. Using these screens, NOW Gallery are able to project images with breath-taking clarity and 4K resolution; producing sharp pictures with inherently high brightness and optimum contrast, just the result required from an Art Gallery where display truly is the ‘name of the game’. With these screens and an E-Vision 4K Laser Projector with 7500 lumens brightness and 0.8 lens per screen, NOW Gallery are able to project chosen content such as videos or images, enabling it to serve a number of functions. For example, where the screens are placed offers NOW Gallery a fantastic opportunity at promotion, providing them with what can essentially serve as large advertising screens in a prime location to ensure maximum impact on passers-by. Installing such screens in this location makes for incredibly versatile fixtures that can be used for whatever advertising purposes required, from advertising events, special offers, providing information or simply to just advertise a specific exhibition. Another use for such a screen could see it utilised as part of the customer experience, displaying leading or featured art pieces for the purposes of an exhibition itself. 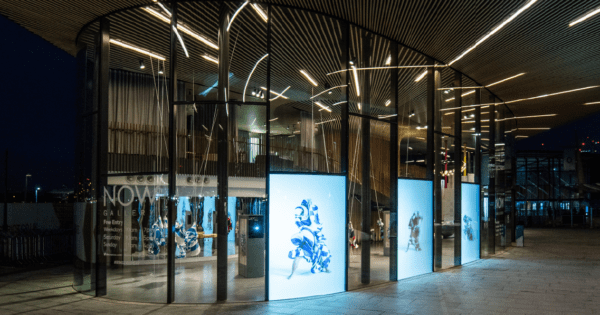 This offers NOW Gallery additional exhibition space that is not only seen prior to most other installations, but also a premium space that enjoys the technical benefits of High Gain Rear Projection Film, benefits that interior displays do not enjoy. Such screens offer customers a ‘taste’ of what to expect within the Gallery, with a combined brightness of 22500 lumens across all 3 screens, they shine especially brightly in the dark and at night time when the Gallery may not be as visually productive as it could be in the day time. As such, art displayed on these screens may appear more impressive when highlighted in this way compared to traditional display methods. Indeed, the gallery themselves were thrilled with their technological investment commenting, “High gain film enabled NOW Gallery to have large, sharp, moving image with definition and quality on our gallery windows. The contemporary dancers filmed are projected onto the film and come alive on the outside of our gallery which is all made of glass. We couldn’t have hoped for a better effect.” Institutions of artistic excellence are often very well-lit interior environments with a high degree of ambient light. 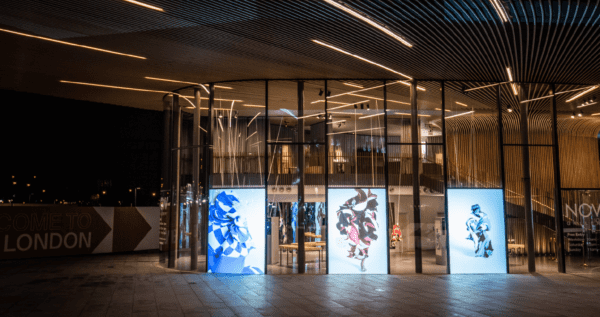 Using High Gain Rear Projection Film on exterior facing windows helps to bring this environment to the outside of the Gallery, conveying the message of brilliance and illumination seen inside to passers-by and entrants on the outside. The Pro Display Group offers a solid range of products that will excite your students. In addition to the product mentioned in this article, there is a wealth of information about our product options available to you on our Pro Display or Intelligent Glass websites. If you have some ideas about how you would like to integrate our technology into your displays, please get in touch using the form below, or call us on +44 (0)1226 361 306.